"I stumbled across the Cloughie website this morning and have thoroughly enjoyed reading some of his quotes and escapades. My only connection with Forest was in the seventies when I asked my Mum and Dad for a replica Forest shirt as I thought they were really flash and I think Trevor Francis had not long signed for them! I live in Swindon and follow Swindon Town FC but, like millions, can't fail to admire what the great man achieved. The word 'legend' is greatly overused, but the true meaning of it was invented for Cloughie. Thanks for the super memories." Gary, Swindon Town fan (email address supplied). "As a Nottingham Forest fan during the glory years, they were the best times I ever enjoyed watching football. Brian Clough's achievements there and at Derby (considered two minor footballing cities) must certainly rate him with the other managers who have been knighted." Stephen Young, Toronto, Canada and previously Melton Mowbray (1972-1989). "I remember being at secondary school back in the early 1980's (the Grove Comprehensive, Balderton, near Newark) and Brian was the guest speaker at the end of year 'Speech Day'. The quote I will always remember is when he said: '...and when your teachers tell you that it's not about the winning, it's the taking part that matters.. well, that's rubbish. Of course winning matters. That's why we keep score.' I use this quote myself, even now, when encouraging my daughter in her sports." Mark Milford, Grantham, Lincolnshire. "I used to sell scratch cards for Nottingham Forest in the 1970's and was in the Pools office at the City Ground the day Mr Clough was being shown around by a club official. It was in the first month of his arrival at the club and I was about 24 years old. As I stood in the office, Mr Clough's voice rang out: "What do you here, lad?" "I sell scratch cards," I meekly replied. Mr Clough said to the Forest man: "It's men like this that keep this club going." From then on, Mr Clough could do no wrong in my mind." Geoff Williams. "Don't believe in gongs myself, but whilst they are still being given nobody deserves one more so than Cloughie (I'm a Hammers fan), but people who have been good for the game deserve recognition certainly more than the chinless wonders in the civil service." Ken Richardson, West Ham fan. "I never met him, but like the Beatles, Bill Shankly, George Best and precious few others, he brought a ray of sunshine into my northern childhood. I used to live in Manchester. I remember when Forest were riding high and Cloughie was the man we City fans loved to hate. They came to Maine Road and we beat them 1-0 with a goal by the legendary Pole, Kazu Deyna. What I admired about Clough was the way his teams played and his ability to bounce back. I also remember him on the soccer panels on TV - he was a breath of fresh air. He christened the 74 Polish goal keeper Tomasewsky a Clown and showed no sympathy for the Brazilian keeper when Francis Lee kicked him in the head in a 50-50 ball situation, saying 'if you put your head in the way you can't complain if it gets kicked' or words to that effect. Keep up the good work." Andrew Demetriou, barrister, Nicosia, Cyprus. "Born and raised in Manchester, I am of course a life-long City fan. Around 1959, my father forced me to attend a league match at that place we don't like to mention! You know, just up the road from Old Trafford Cricket Ground. The Reds were hosting Middlesbrough and a home victory was inevitable. However, my eye was caught by the lively, classy and slightly arrogant Middlesbrough Number 9 - clearly a cut above the mediocrities with whom he was playing. Like all the other little kids, I was passed over the heads of the crowd to stand right at the front, directly behind the Stretford End goal. I still have this picture in my mind of him - ending up grabbing at the back of the net having gone up to challenge at a corner, no more than 10 feet away from me. Some home fans might have wondered, 'Who does he think he is?' Brian Howard Clough, of course. Not necessarily the greatest human being in the history of British competitive sport..but in the top one!" Howard Paul, Chiang Mai, Thailand. "By heck he should've been knighted when he was alive. Football is essentially an entertainment business, and by heck Cloughie was at least as entertaining as his teams, and some of them won the European Cup, and the Top Spot in the English League. If Fergie and Bobby Robson are 'Sirs', then it is only right that Cloughie joins them." Karl Hoskin (an Arsenal fan, who would have loved Cloughie to manage the Gunners). "How sad to hear of the death of Barbara Clough. Having had the pleasure of meeting her at the statue celebratory dinner in Nottingham, I can safely say she was a lovely woman and was happy to take some time to say hello and sign an autograph for me. Very sorry to hear of her passing. Great website - keep up the good work!" Richard Hallam & Family. "Brian was a lovely man. I worked with him on a TV commercials script for Parker Pens with the actor, Arthur Lowe. It was shot in the boardroom at Arsenal, when Terry Neil was the Gunners manager. The press were tipped-off that Cloughie had been spotted at Arsenal and within half an hour there was a media scrum outside Highbury. Terry Neil had to come down and tell the assembled paparazzi that Cloughie was only doing a TV ad!" David Horry, former advertising executive, now living in Shanghai, China. "Despite not being born until Cloughie's final season as a manager, I have grown to adore the man - and I am not a fan of Middlesbrough, Hartlepool, Derby or Forest. Clough was such a character with such a heart, and such an undying passion for the game. The greatest tribute I can give him is that, whenever I'm feeling down or in need of inspiration, I go through some of his old clips and videos, and I instantly feel better. I never met Brian, or even understood who he was until shortly before his death, but I feel like I know him. As Old Big 'Ead once said about his great friend Peter Taylor, I hope he's alright." Greg Lea, London. "I am Timothy Hinchey of the Russian online newspaper PRAVDA.Ru, director of the Portuguese version. I would just like to say that I came across this site and looked through it fondly, remembering Cloughie with many smiles and a great deal of respect. I am sure that this is how millions remember him. He brought to English and world football a special characteristic which was very much born with him - a wild flame, an unbridled horse, a raging fire. The boldness to try new ideas and the strength to keep to his convictions. THAT is why he was so hugely successful - and we must remember he did not take over billionnaire clubs with fat pay cheques, he made the clubs himself. Derby and Forest were nowhere when he brought them onto the map.He brought a lot of fun and joy to a lot of people for a lot of years. Thank you." Timothy Hinchey, Pravda. "As a Gooner living in Peterborough in the 1980's I often used to watch Cloughie's Forest if I was not at an Arsenal game. Forest under Brian Clough played football how it should be played: entertaining, disciplined, tactics made simple and always Easy on the Eye were Cloughie's trademark for football during his 18 years at Nottm Forest. There's only one Brian Clough (today's managers will be relieved at that! )...a football legend who would be successful in the Premiership even in today's game." Keith Goulding, East Durham Gooner. "I only saw you once Bri - you were in your famous green sweatshirt alongside Peter and I was a young kid in the stands at Highfield Rd, Coventry. Although I was a mad CCFC supporter, you and your team were the example of 'magic' of football. Your genius was not lost on this young kid and I will always remember the 'Yarwood, follow that' line on the 'Whole World in His Hands' record - what superb comedy that was. Brian - you are missed. Love to your family." Mark Pitt, Atlanta, Ga, USA. "I am a fan of English football, and wanted to give all respect to one of the greatest coaches in the world, Old Big 'Ead. Simply the best, Brian Clough. Thanks for what he gave to football. Greetings from Costa Rica." Federico Carrera Rivas, San Jose, Costa Rica. "I'm a Sunderland fan and 14 years old. I think Brian Clough was a legend - the greatest player and manager there has ever been. Should have been England manager. Brought Derby and Forest from nothing to league champions. I can't think of any other manager who has done that. 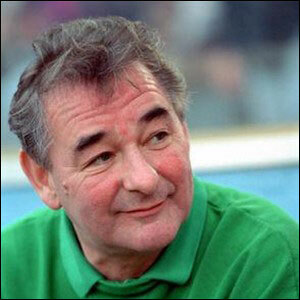 He should have been Sir Brian Clough. RIP Cloughie. "Joe Cox, Sunderland. "Thank you for that great statue for a great man. He should have been knighted, he should have been England manager. I am a Man U fan - I live in Manchester, but my Dad and I were right behind his team in Europe all those years ago. Thank you, Brian, for the memory. Regards." Tony Dunn, Manchester. "I'm Scottish and I'm 54 years of age. I never met Mr Clough but I feel like I grew up with him. He was always on the telly and seemed like a family friend, being in our living room so often, as a regular visitor to my home. One of my favourite stories about Brian is how on travelling on the team coach to Celtic Park, from Glasgow Airport, he spotted 'Davie Hay's' (the pub of the then Celtic manager) and ordered the bus to stop and all his staff off and into the pub, to enjoy some 'refreshment.' Players, trainers, etc; all had a drink - at the expense of Davie Hay as, when Clough was asked to settle the bar bill, he referred the barman to see 'the Celtic manager!'' Nottingham Forest had their 'away goal' safely tucked away after that bit of psychology. Brilliant stuff from one of the true originals, and there weren't many, even then! Kind regards." Keith Landles, Edinburgh. "I would just like to extend my gratitude to you for finding time and the will to honour a legend like Mr Clough. I call him this because when I arrived at the City Ground for a trial aged 14 he insisted I address him as so - whereas my uncle Eddie was permitted to call him Brian. Although, I was only at your great club a short while, the man left his mark on me and I will never forget him. I have just recently got my coaching qualifications and it is principally down to Mr Clough's inspiration that I chose to go down this route. It is shameful that English football as a whole doesn't give him his full credit, but there are those of us who realize that some people are too important to be forgotten. I must point out at this juncture that I am a lifelong Liverpool fan and a proud Dubliner - but his effect on my life and my football thinking is a testimony to the power of this one off human being. With love, respect and gratitude." Peter Smith, London. "The best tribute I can pay Brian is that I witnessed his Nottingham Forest Champions elect come to Old Trafford on December 17th, 1977 and destroy Manchester United 0-4 in front of 54,000 people. I've seen teams win well at Old Trafford before, but no team has outclassed United so spectacularly in my time as a Reds fan. It was a pleasure to witness a team come and perform like that, even if the team I was supporting was on the receiving end. Brian was a complete one-off in terms of achievement, character and status. Of course, there have been other successful characters like him, but none are loved and remembered as fondly as he is today. He is sorely missed as a person, and particularly in football." Graham Wilde, MM Canada Ltd, Canada. "I am a Celtic supporter, but I will always admire Brian Clough. He had huge sucess at Derby and also Nottigham Forest. He was the greatest manager England never had! "Michael Foxton. "Brian Clough was and always will be my hero. I now live in New Zealand. My fondest memories are of Brian and the team showing the European Cup in the market square and Brian signing my Forest shirt. Still have the shirt. Long live Brian's memories." Marco Baguley, New Zealand. "I was never a soccer fan until Cloughie took over Nottingham Forest and then I was hooked with the success he brought to a minnow club. I will never forget their 2 European Cup triumphs and the accolades they acheived along the way. RIP Brian Clough. There will never be another manager like him, a once in a blue moon manager. Regards." Noel Baldwin, Echuca, Australia. "I've just read Cloughie's autobiography for the second time. A true legend and the most remarkable British football manager of all time. His family must be so proud that His legend lives on. I'm a Chelsea fan but can remember supporting His Forest teams in European competition when I was a lot younger. All the very best to Cloughie's family." John Winning, Langley, Berkshire. "I'm a lifelong Wednesdayite, and have been following them for over 35 years. That said, I've always believed that Mr Clough was indeed the greatest manager England never had. His death has been a tragic loss to football. I would whole-heartedly support any campaign to give him the honour he deserves." Garry Lee Jackson. "As a Bristol City supporter, my first match was against your Forest side in the 1989 League Cup semi-final when you got to Wembley. I have long since forgiven that result and the biggest complement I can pay you is that your achievements at Derby and Forest show that no matter how bad it gets, never give up hope. Dreams can come true. Wishing you all the best." Jon Phipps, Bristol. PREVIOUS TRIBUTES: The following e-mails were received before Mr Clough's sad death in September 2004. Those e-mails wishing him well after his operation were passed on to him at the time and he thanked the website editor personally for all the good wishes. There are also further messages regarding the knighthood campaign. See the link at the bottom of the page. E-mails received by youngman are still added to this page. Further messages which were received following Mr Clough's death were put on the messageboard. "You were resilient as a player and manager. I'm sure you'll pull through this in no time. Get well soon, Cloughie." John Geoghegan, Petersfield. "My thoughts and prayers are with you for a speedy recovery. I have followed your career since your great playing says at Sunderland. What a loss it was for England, when the powers that be ignored the most obvious choice for the manager's job. Because of you, I have ever since remained a die-hard Forest fan." Maurice A. Phillips, Singapore. "All good wishes for a speedy recovery and continuing good health. I have followed your career from afar and was very worried when I learned you were so ill. Keep up the good fight. All the best." Peter Woodhouse, Melbourne, Australia (ex-St Oswald's Church and ex-Mbro RUFC). "Dear Mr Clough, I hope you continue to get well. We all miss you at the City Ground. Come and see us soon. All the best." Sarita and George Scott. "Dear Mr Clough, I hope you get well very soon. As a boy I loved to watch you and Forest with my Dad on the TV. Now I run an under-13 team and try to instill your values. You should have had the England job. God bless you." Chris Prevett, Bradford on Avon, Wiltshire. "Just finished reading Walking On Water. It was a very good read, especially references to my home town, Hartlepool. All the best, Brian." Kenny Hill, Hartlepool. "Get well soon. I hope to see you soon in your shop. Be good." Steven Fox, West Bridgford, Nottingham. "Best wishes for a speedy recovery. From a long-time admirer." Noel Smyth, Dublin. "Get yourself back up soon lad, we need Old Big 'Ed back at the City Ground to see us into the Premiership!" Graham Pilkington, Nottingham. "I wish you a speedy recovery. I hadn't realised you were so ill. You have given me and all football fans so many memories. God bless you." Paul Dodd, London. "Mr Clough, I have a lot of great memories and made a lot of great friends from supporting Forest for many years now. I would like to thank you for that. You are the one and only football manager. I wish you a speedy recovery." Sheila MacDonald, Toddington, Bedfordshire. "Glad to hear you're getting better. I followed you from Derby to Forest as I come from Burton and had no sense of rivalry. Wish you were still managing, but your family and health come first. I met you once and will never forget it." David Howlett. "Just wanted to say my partner and I are big Forest fans, but even bigger fans of you! We wish you a speedy recovery and our thoughts are with you and your family. You are without doubt the greatest manager England never had!" Kelly and Jay. "I was fortunate to be watching my beloved Forest a year or so before you arrived. Then it became dreamland. I once waited nearly three hours after a game to see you. You gave me a few moments of your precious time and signed a picture for me which still stands proudly in my office. Thank you for such amazing memories. I truly wish you the best for the future. Get well Brian and make a full recovery." Chris Meakin. "Dear Brian, I wish you a speedy recovery from your operation. Like yourself, I was born in Middlesbrough and started watching the Boro at the age of seven. I remember those goals you scored. In management you were a roaring success. An icon of the game. Thank you for many years of entertainment and enjoyment. Get well soon." Eric Carter, Sydney, Australia. "Good luck, big man. You'll never walk alone." The Glaister family, Queensland, Australia. "Brian, please make a full recovery quickly and come back to manage the Rams again. I can't explain to the young ones today how good Derby were, when you and Peter Taylor were in charge at the Baseball Ground. It was fantastic. Best wishes." Noel Hanna. "Good to see you on the road to recovery. Look forward to hearing your dulcet tones once more over the airwaves." Brian Craggs. "Brian, I've been a Forest fan all my life. I was lucky to see such great times at the City Ground. And all because of you. I would like to wish you a speedy recovery and hope to see you kneeling before the Queen to get your biggest prize, which you truly deserve. A knighthood." Graham Bowater and all the lads in Arnold, Nottingham. "Mr Clough, very best greetings from Canada. I have just finished reading your biography and you would have made a great England manager. God bless and get well soon." Bob Wilson, Dundas, Canada. "Dear Legend, get well soon. Burton's Aaron Webster needs someone to shout at him. Best wishes." Geoff Turner, Allestree, Derby. "Mr Clough, may I wish you all the best and I hope you recover from your operation soon so that you can spend more quality time with your family. I have followed your career since I first watched you at Ayresome Park. I was taken by my father. I am enjoying your book and finding it difficult to put down. It contains many memories for me, with references to Wilf Mannion and Rea's Cafe. Get well soon." Geoff Artley. "Don't you think of leaving this earth before I've had the chance to meet you in person. I'm glad to hear you're getting better. I'll be in England (Derby/Burton) next year." Steve Wain, Buende, Germany. "You have always been an inspiration, Mr Clough. Get well soon. The world needs your voice. Best regards." Bjorn Persson, Sweden. "God bless and get well soon. Let's have a 'K' to go along with the new liver." Alan Wexler, Brooklyn, New York, USA. "Dear Brian, Get well soon. We need you to be around for some time to come. Best wishes." Don Anthony, Stanmore. "A speedy recovery to you. You are in our prayers." Declan Kelly and family, Nottingham. "On your feet soon, baby. Get stuck in. We need you. But above all, take it easy." John Ellis, Lichfield, Staffordshire. "Brian, get well soon, mate. I want to see you back at Forest, giving Paul and the boys your magic touch in our quest for promotion. The whole world is rooting for you, young man!" Paul Banwell, Wells, Somerset. "All the best for the future, Mr Clough." David Pickering, Huddersfield. "Mr Clough, thank you for giving me the privilege of watching Nottingham Forest play such entertaining and winning football during your time as manager. I wish you a speedy recovery and hope it is not too long before I hear the fans at the City Ground show their appreciation and regard for one of the legends of football at your next home game visit. Best wishes." Neil Greaves (Nottingham born), Wellington, New Zealand. "Dear Brian, I wanted to wish you a speedy and full recovery. Your name is part of my family memories. My father, Jack Cullen, worked for Nottingham Forest for many years and often spoke well of you. He loved being associated with the club you helped to raise to a great football standard. I hope you are soon back on your feet." Carol Traynor. "Brian, I have been a Forest supporter all my life. I supported them because of you and even as a young kid you caught my imagination. Your book which I read on honeymoon (my wife wasn't pleased) was fantastic. You will get well and hopefully when I am up at the City Ground you will be there too. I wish you all the best." Daniel Hawkins, Brentwood, Essex. "Mr Clough, glad to hear your health is getting better. I wish you and your family the best. I am Dutch and an Ajax fan. Remember your great Nottingham Forest team was better than Ajax in the semi-finals of 1980!" Oscar Borghardt, Diemen, near Amsterdam. "Brian, best wishes for a speedy and healthy recovery and thank you for all you did in your time in football. You're the best." Billy Halligan, Leeds. "Dear Brian, just a brief note to wish you all the very best. I hope your recovery is a speedy one. I look forward to hearing news of your successful rehabilitation. Yours sincerely." Steve Rawlins, Oxfordshire. "I've read through all the messages and cannot think of anything else I can add other than I wish you all the best for a speedy recovery. Lots of love." Abigail in Douglas, Isle of Man. "Get well soon. We are thinking of you. You are a great man." Jill Partridge. "Been watching the Reds since 1966 when I was a very young Trent Ender. At the beginning of the Seventies we were just an average second division side until we appointed the greatest manager this country will ever see. We never looked back, all the trophies, all the great memories we will never forget. So get well soon, Brian, we are all thinking of you. You were in great form the other month when you signed your book for me...chinwagging away with me, I couldn't get a word in..." From Cunno...and Pecky, Floyd, Smurf, Kitch and the Lads. "When a young, brash and extremely gifted young man became manager of Derby County I was taken on a roller coaster ride through the most exciting football I have ever seen. So many magnificent games. Those of us who were part of it are eternally grateful. So, at this time when you are up against it, my good wishes and prayers are for you. I hope this small thing will thank you for the magnificent time you gave me between the age of eleven and seventeen. I may never have achieved my dream of playing for Derby County but you replaced that with one equally as good, if not better. I shook your hand after the forum at Pride Park. I look forward to shaking your hand again. From all my family our thoughts are with you." Tony Eyre. "Brian, you may have needed a new liver, but there's nothing wrong with your heart. Get well soon." Greg Tapper, Bournemouth fan. "Here's hoping for a speedy recovery, Old Big 'Ead! "Kieran McManamon, Sydney, Australia. "Wishing you all the very best for a speedy recovery, Brian. Your book is fabulous, witty and enjoyable. I remember my Dad taking me, as a young girl, on the protest marches in Derby when you and Peter Taylor left the club. I sincerely hope you will be feeling better soon and it's not too long before you are back at Eton Park watching 'your Nigel' play." Elaine Newall. "Ere, Old Big 'Ead, get off that bed, it's not full time yet. Thanks for the memories." Keith Buttery, Forest fan. "Having supported Forest all my life, I've been able to cherish many great memories of their success under your leadership. You are a complete one-off and I mean that in a positive way. Get well soon, Cloughie." Martin Kennard. "Dear Mr Clough, I was surprised to hear of your operation as you seemed in such good form when you signed your new book for me in Manchester a few months ago. I'd like to wish you a speedy recovery, and good luck with your new liver - it's perhaps the only thing you deserve more than a knighthood. All the best." Mike Finlay, Manchester. "Dear Brian, just wishing you good luck in the future and hope you make a good recovery. You were always an inspiration for me when I was growing up. I tried to instill your positive attitude in my sons. Both became boxing champions. Good luck." Norm Lothian, Perth, Western Australia. "I hope and pray that after your operation you get as many happy hours as you have given me over the years. If you do, then by my reckoning you will live to be 150. "Mark Singleton. "Get well soon, Brian. Looking forward to seeing you at Burton Albion and Nottingham Forest once again. "Ivan Adkin. "Brian, you've done it again. Taken everyone, including the media, by surprise. You had the call there was a liver available for your transplant and you just went into the hospital and got it done and let everyone know when it had happened. That's the Brian Clough we all know. That's how you did your football business and I, like many others, admire you for that. All the best and we hope to have you back home in Derby soon." Stu Palfreyman, Derby. "Just wanted to offer my best wishes to the Great Man. All of the Forest faithful are rooting for you." Alan Fisher. "Keep your chin up, mate. You're still the greatest! "Jason Buttery. "Wishing you a successful operation Brian. You have always been the manager I admired the most - after our own Shanks, of course! You'll always be a hero to me. All the best." Susan Hawkin-Harris, Liverpool supporter. "We wish you a speedy and complete recovery and look forward to many more years of your unique insight and opinions. The volume of tributes from people all over the world clearly demonstrates the esteem in which you are held. All the best." Jim Corning, Columbus, Ohio, USA. "Dear Mr Clough, after hearing of your life saving operation, I had to send you my very best wishes for a speedy recovery. I have been a Forest fan since the age of two when I was first taken to a game at the City Ground. I would sincerely like to thank you for the years of happiness you brought to the club's supporters. "Sarah Clarke, Gedling, Nottingham. "Dear Mr Clough, hope you are on the safe road to recovery. Thanks for the memories. "Malcolm Allen, Stockholm, Sweden. "To the greatest manager to ever walk the earth, wishing you a speedy recovery. We hope you'll be back at Eton Park soon supporting Nigel and the boys. "Melvin and Lee Jones, Burton on Trent (Burton Albion fans). "Get well soon and make a lot of people happy. We need you around to may be 'gee' things up a bit in the footballing world. So let's be hearing your comments and ideas on today's game soon." Bob Finlay. "Thanks so much for the years of success. I was twenty-one when Forest won the League and League Cup. Those were the happiest years I can remember and there were others to follow. I was always so proud of the way your teams were turned out and their behaviour, not to mention the wonderful football. Please do take care. We all want to see and hear your wit and wisdom for years to come. I wish you a speedy recovery and the best of luck for the future." John Simpson, Lympne, near Hythe, Kent. "We are all wishing you well and hope you are home soon. You will never be forgotten by young and old. Keep fighting. "Forest fans via Margaret McManamon. "Cloughie, a short e-mail to wish you a speedy recovery. Best wishes." Darrell Booth, Coventry. "Mr Clough, Get Well. There is only one English gentleman who made such an impact on the beautiful game over the past forty years and we don't want to lose you just yet." Chris Brown, Monroe, North Carolina, USA. "I hope all fans of Brian will join me in wishing him a speedy recovery from the liver transplant. I was so happy to meet my hero in September at a book signing. He is and will be forever my all time football hero. Love you lots, Brian. "Carol Driscoll. "I would appreciate it if you would be good enough to pass on my best regards and wishes for a speedy recovery. I'm sure there are fans all over the world who will be praying for him." Colin Foster, Geordie (Toon Army) exile in Saudi Arabia. "Brian, we wish you a speedy recovery. Very best wishes from your biggest fans. "Simon and Louise Fisher. "To the greatest manager of them all - get well soon after your liver transplant." The O'Sullivans in Derby. "I just wanted to send my get well wishes from the USA to Brian Clough. He knew talent and could motivate average players into extremely effective team players." Stephen Hughes. "Please pass on my sincere get well thoughts to Brian. It won't be long before you are up and about. We are thinking of you." Adrian and Carol Rose, Ripley, Derbyshire. "I would like to pass on a 'get well soon' message from myself and my two sons (all Man City supporters) and hope Brian will make a full and speedy recovery. Good luck Brian, we are thinking about you. "Richard, Andrew and Simon Wright, Aston, Nantwich, Cheshire. "Wishing the old so-and-so all the best for a speedy recovery. We want him around for much longer, so tell him not to disappoint us all. Get well soon, God." Mike Noble. "Mr Clough, you are a great man. But I expect you know that. I have always enjoyed listening to you. You are right up there in my hero list. "Christopher Sloman, Perth, Australia. "I would say it is full testimony to him as a person that he is idolised not only in Middlesbrough, but in Sunderland, Hartlepool, Derby and Nottingham. With time, the same would have been true in Brighton and Leeds. It must be very doubtful that that has been achieved by anyone else in football. So many good memories. From the good folk from the Boro, to the good folk everywhere who revere Brian Clough, I send the very best wishes. We can all be happy for having something to remember him by. And to Brian, God bless you. No honour properly deserves you."F.R. Milburn, Middlesbrough fan. "Dear Brian Clough, I saw you at Eaton Park, the home of Burton Albion. We talked about the match and I said we'd give them a lesson on how to score goals. I'm that young lad in the wheelchair. See you at the next home game. P.S. You're still the best. "Ian T. White. "A legend in British football. Even after all the years, I still miss his magical management style. "Mike Bootes, Durban, South Africa. "Clough was a genius. Simple as that. It was a crime he never managed England. A life sentence for those in charge at the FA. "Â Albert Lea. "The best manager Sunderland and England never had." Allan Robinson, via readytogo.net. "The greatest manager ever. I was sixteen when I went to Madrid to watch us lift the European Cup. Brian Clough was simply a football legend and I feel honoured to have shared the glory years at Forest." Mark Travers, Newark. "I was in the Roker wing stand on the day that Brian got his knee injured. Everybody thought he would get up and walk away, he was so tough. I later saw him try to play against Leeds but he was a shadow of his former self. His partnership with George Herd was one of the best inside forward combinations I have ever seen and I treasure the memories." Tony Sharkey, via readytogo.net. "Brian Clough is the best manager ever. I am from Munich in Germany but am studying in Derby. I feel it was a great pity that he never managed my own team, Bayern Munich." P. Moskwa, Derby. "My first football memory is seeing the Forest players on the bus going into the city centre after they had won the European Cup for the first time. I was six and was on top of my brother's shoulders. He was 12 and a complete Forest nut. This memory will never fade and neither will countless other memories and emotions. Thank you Brian Clough and Peter Taylor. From a Nottingham lad, stuck down south." Sajid Yasin. "Cloughie, we love you and we will never forget the times you brought to our humble little club." Steve and the lads from Bulwell, Nottingham. "Among my most valued books/videos are: 'With Clough by Taylor' and 'The Brian Clough Story'. Some of the stories are superb and whilst some might appear unlikely, with Cloughie you just know they're true!" Steve Jones. "I think Brian Clough is the greatest manager in history. Even though I am a Leeds fan, and he only managed us for 44 days, his tactical brain was fantastic. Long live Cloughie! "Nick Buxton. "What you achieved at Forest was truly remarkable. Having supported Forest since the late Fifties (I am now in my fifties), your arrival gave the supporters hope for the future. At the time, we were a club with very little money and no ambition. But, oh how that changed. Unfortunately I emigrated to Canada in 1977 and missed out on the most glorious period in the club's history. Your edict that your players play the game it was meant to be played, with honesty and fairness, should be a sense of pride for all those who played for you. Thanks for the memories, Brian. Have a long and happy retirement." Frank Swain, Alberta, Canada. "The man had class. He was not only a great tactician but a wonderful man-manager long before the term became fashionable. His use of the carrot and stick has never been bettered. They all believe you need money. All Cloughie ever needed was Cloughie. Mike Trapido, Derby County fan, Johannesburg, South Africa. "Brian Clough, we will never forget what you did for Forest - like we will never forget your green jumper. All the luck in the future and all the best to Nigel at Burton. "Steve Nicklin, Stuttgart. "Brian Clough is now a regular feature at Burton Albion matches. A friend of mine's firm sponsored one particular match and as a result he was 'wined and dined' by the club after the match. He took the opportunity to approach Brian and tell him he was honoured to be in the same room as a footballing legend. Brian cast his eyes around the room and replied "Where? Who's that then?" The humour is still there! "Bob Coates, Burton-on-Trent. "I have been an avid admirer of Brian since I used to watch him at Roker Park with Sunderland and during his managerial reign at Nottingham Forest. I say irrespective of age, bring him back into football as manager/coach of England. There has never been anyone like him." Campbell Clark, Selby. "I became a lifelong fan in the Seventies when I watched Nottingham Forest in the Second Division. Brian Clough was at the centre of a storming assault on the established 'great powers' of football. Brilliant. "David Lovato, Washington DC. "To me, Brian Clough was the greatest manager to grace the game of football. I have been a Forest supporter for 23 years and have very fond memories of the glory days. Even when he left Forest I still liked to keep in touch with what he was up to, and thanks to this site I can do that." Ben O Kelly, Co. Limerick, Ireland. "Brian Clough is a unique and extraordinary living legend. He took raw talent and made them into stars. It's with the greatest respect and absolute delight I'm able to send you this message. I wish you and all of yours well." Peter Brice (Forest fan). "He is without doubt the greatest manager that ever lived. I've never been a Forest or Derby fan, but I've always been a Brian Clough fan. His achievement of taking Forest to a European Cup within two years of being in the Second Division will never be equalled. I love watching all his interviews. He's so outspoken and entertaining, unlike any of the managers of today. There should be a campaign for Brian to be knighted." Paul Greenfield, Southend. "Brian Clough is a genius to do what he did at Forest. All Forest fans owe him a great deal. How can Alex Ferguson be knighted and not Cloughie. He achieved so much in so little time. Good health to Brian and Barbara. "Steve Whalley, Redcar, North Yorkshire. "The greatest England manager we never had. Why? Because the establishment was scared of him. Can anyone explain to me why Alex Ferguson was knighted and Brian Clough was not? He will have to remain the champion of the people. "Paul Dodd, Middlesex. "His achievements are unequalled and are likely to remain so. His teams played football the right way and, unlike modern-day champions, his players' behaviour was exemplary. "Richard Hallam, Nottingham. "Brian, you are England's greatest manager, who played the game as it should have been played -- fast, flowing, attacking football. All the best. "Chris Freeman, Preston North End fan. "Mr Clough, you would have made the best England manager. You said your bit in the interview with the FA and they did the worst thing for this country's football team by not appointing you! There will be only one manager of Nottingham Forest -- and that is you. "Colin Smith. "Brian Clough was the greatest manager because of his motivational skills and his ability to spot football potential and then turn that potential into reality. "Ron Whan, Alberta, Canada.